NED. GEREF, TEOLOGIESE TYDSKRIF deel xxix(4), Januarie, 1988, 29–40. The generation to which I belong was, theologically speaking, dominated by Karl Barth. It has become a platitude that the 20th century started for European theology in 1919 with the publication of the first edition of Karl Barth’s Römerbrief1, and it was only in the late fifties and the sixties that the influence of Barth declined2. This means that my generation, which started its theological training shortly after World War II, has had the privilege of receiving our theological training during the period when Barth was at his peak. When I started my theological studies, only the first six volumes of the Church Dogmatics had been published. So we had the privilege of following the publication of the rest with intense interest. From the beginning it was difficult to interpret Barth correctly. Many of the first reactions proved to be inadequate, not only because they misjudged the intentions of Barth, but also because Barth was a dynamic theologian, perpetually rethinking his own position and making adjustments as he saw fit. Today the correct interpretation of Barth is still a live issue. Fresh perspectives keep coming up. Without any doubt the last word on the interpretation of Barth has not yet been spoken. It is not my intention to provide an overview of this discussion. Rather, on a much more personal note I would like to make a few remarks on the way in which I, and some other theologians of the Dutch Reformed tradition have experienced Barth, and why his theology in some respects was a cause of joy to us, but also provoked within us some hesitations and reservations. 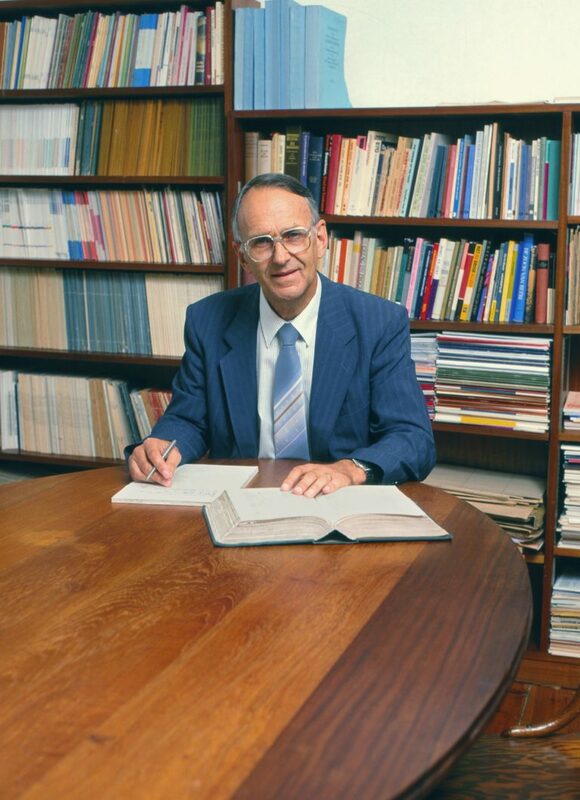 Personally, I was introduced to Barth by professor A B du Preez, my professor in Dogmatics in Pretoria, and by the works of a number of Dutch theologians such as Haitjema, Van Niftrik, Berkouwer, Schilder, Noordmans, Miskotte and others. There was a sharp difference amongst them in their appraisal of Barth. Haitjema, Van Niftrik and Miskotte were Barthians and they followed him in all respects, regarding his theology more or less as authoritative and conclusive. Miskotte called Barth a theological “phenomenon” and made no secret of his limitless admiration for him3. On the other hand, the Neo-Calvinist theologians with whose works we were best acquainted, were all very critical about him. A long list could be made of the aspects of his theology which they found unacceptable4. One would have expected them to have had more appreciation for his break with his liberal past and his opposition against the modernism of the 19th century, but that did not seem to impress them as much as the differences in approach and paradigm that obviously existed between his theology and theirs, even apart from specific points of disagreement on such matters as the doctrines about revelation, the Scripture, election, infant baptism, etc. However, neither the sometimes irritating applause of his disciples, nor the severe criticism of other theologians were enough to stop some of us from reading Barth. He simply could not be ignored. Berkouwer always criticized Barth, but he remained in a constant dialogue with him, and could in the long run scarcely hide the growing enthusiasm with which he was doing it. He gradually grew more sympathetic towards Barth, despite serious points of difference5. So we also kept reading Barth, often fascinated by what he had to say. *Paper read in commemoration of Karl Barth’s centenary, 1986.
in which we lived, of the hybris of modern man and especially of religious man, of the theology of the day, of Christianity as social phenomenon and of the church. But this criticism obviously had its counterpart and perhaps was even the result of the positive contents of his message about love and grace, the majesty and power of the living God about whose triumph over all the powers of sin and death Barth obviously had no shadow of doubt. Barth’s theology was brilliantly original, but not without signs of relationship with a great number of kindred spirits who had had a profound influence on him. In a certain sense his theology was a fascinating and unique blend of different influences that shaped his mind, such as for instance the critical views of Overbeck and Kierkegaard on the one hand, and the practical spirituality of Beck, the Blumhardts, Kutter and Ragaz on the other. But what fascinated us most of all was the profound impact of Paul on his vision of the centrality of Christ in the relation between God and man, which-is the real topic of theology6. Barth could speak about Christ in such a way that one could not help becoming enthusiastic about Him and the gospel of which He is the content. The fact that we started reading Barth at the stage when he had already reached the mature position of the Church Dogmatics made it easier for us to hear his central message about the grace of God, his stress on the objectivity of our salvation in Christ, and his radical rejection of neo-protestant subjectivism. Somehow Barth could formulate the crucial issues of evangelical faith in such a surprisingly new and convincing way, that we experienced it as a new dawn for Biblical theology. He obviously had so much pleasure in his explication of the gospel, that we believed him when he said that theology was a cause for joy. Those of us who had the opportunity to meet him personally were struck by his happiness and positive attitude towards life. There seemed to be no tension between his theology and his life. He succeeded in giving a joyous sound to the word “God”, helping us to understand that God is not only love, but also joy7. However, the critical element in Barth’s theology touched us in a special way. The complacency of the church, the self-satisfaction of some forms of the Neocalvinist theology with which we were acquainted, the shallow moralism of Christianity as a whole, the self-deception of the pietistic, Arminian and Methodist preoccupation with personal holiness and perfection with which we were perpetually confronted within our circles – these were the things for which Barth opened our eyes. Somehow, we were just ripe for his critical approach towards empirical Christianity and his rejection of the type of religious familiarity with God which we knew all too well8. Over against such familiarity with God, Barth prophetically testified to the deity of God – the deity of a God so absolutely unique in his relation to man and the world, so overpoweringly lofty and distant, strange and even wholly other, that it was impossible to continue to talk about this God in the concepts of liberal theology. We rejoiced in the “sudden conversion” of Barth in Safenwil that caused him to break with the religionistic, anthropocentric and humanistic theology of the 19th century which, according to his view, did not really talk about God and his revelation in Christ, but about religious man with his faith and experience9. In direct opposition to that type of theology, Barth opted for a theology of the Word, because he was convinced that nothing else but the Word of God could be the subject-matter of theology. Barth could speak with absolute conviction about the reality and the intelligibility of the Word of God. He never seemed to have any doubt about God and his revelation. He stressed that it was God Himself in his majesty that was the subject and the object of our knowledge of Him. In his revelation God spoke and acted and He made Himself known to us. If God speaks, He also lets us hear his Word, and that Word is the truth. The theologian does his work in remembrance of the Word that has been spoken by God and in the expectation that God will speak again. His task can only be to testify to the reality and veracity of this Word. Barth felt no need to argue about it. There was no place for any apologetic or attempts to supply a philosophical or anthropological foundation or verification in order to substantiate the truth of God’s revelation. The turn towards a consequent Christocentrism that marks the difference between his “Christian Dogmatics” of 1927 and the “Church Dogmatics” of 1932 is indicative of his growing conviction that the reality of the knowledge of God precedes all questions about the possibility of our knowing Him. Barth simply disregarded any form of criticism that was brought forward against him on this point. Any concession in this regard would amount to leaving the position of faith10. Looking back now, I must say that it was the general evangelical thrust of Barth’s theology that caught our interest. In fact, we were fascinated by the phenomenon of such an intellectual giant and sophisticated European theologian proclaiming the Biblical truths which were dear to us. In that sense we rejoiced about what we understood as his return to evangelical orthodoxy. And yet, I must admit that from the very beginning we somehow had the feeling that we could not altogether be at ease with Barth’s theology. Somehow, we experienced that there were elements in his theology that were signals of underlying motives which we could not grasp fully, but which disturbed us and made us hesitate about the question whether we had really understood him correctly and whether he would be regarded as truly evangelical. Such elements were present in his handling of every doctrine. His controversial concept of revelation was but one aspect of it, just as his unexpected rejection of infant baptism was another. We, time and again, were made aware of the existence of certain presuppositions of Barth’s theology which resulted in the differences between him and the theology of the Reformation, although we were not always able to identify them. We felt that it was not good enough to read Barth eclectically against the background of our own evangelical faith, accepting what we could accommodate within our frame of reference, and ignoring the rest. That is why we remained keenly interested in every new endeavour to interpret Barth’s theology, hoping that one day we should be able to understand him fully. Of course, we were not the only ones who had originally thought that Barth had returned to evangelical orthodoxy. Barth’s theology made the impression of a return to orthodoxy on many people. Everybody knew that he was not orthodox in the sense of the 17th century with its scholastic and Aristotelian frame of reference, but this theology was most certainly more evangelical and in this sense also more orthodox than that of the most of his contemporary fellow-theologians in the German-speaking world. Barth’s severe criticism of neo-Protestantism, his rejection of the spirit of the Enlightenment and his positive attention to the classical doctrines of the Christian Church, such as the doctrine of the Trinity, the Chalcedonian doctrine of the two natures of Christ, substitutionary atonement, and his firm stand on the reality of the resurrection and even the virgin birth of Christ, strengthened the impression that he was returning to orthodoxy, and resulted in the designation of his theology as “positive”, “neo-orthodox”, or, in Dutch, “midden-orthodox”. What is more, Barth’s insistence on revelation as an act of God imparting to us real knowledge of Himself with an objective and knowable content, was a clear departure from the hermeneutical theology since Schleiermacher11 and a move in the direction of dogmatics in the original evangelical sense of the word. The rift between Barth and his fellow dialectical theologians, Bultmann and Gogarten, marked his refusal to remain true, not only to the principles of liberal theology, but also to the original position of the dialectical theology in the early twenties, according to which God’s making Himself known to man was an eschatological act of grace that could only be apprehended by faith, but in such a way that it had no abiding content which could be theologically articulated. In that case, the only thing left for theology was of course to talk about faith’s experience with and apprehension of the revelation, but not of the contents of the revelation as had been the case in traditional Christian theology. Barth, and to a certain extent also Brunner, rejected this position and focused their attention on the contents of God’s revelation. That made it possible for them to concentrate on the re-stating and re-thinking of the main classical Christian doctrines and thus to become dogmaticians in the traditional sense of the word12. Peter Berger pictures Barth as a clear example of neo-orthodoxy, which he defines as “the reaffirmation of the objective authority of a religious tradition after a period during which that authority had been relativized and weakened”.13 He suggests that Barth had managed to make what Kierkegaard had called the “leap of faith”, so that the period between the original proclamation of the tradition and its reproclamation as a living power in the present disappears. In that situation the old words come to life again, the old power is experienced once more. But was Barth really that positivist or orthodox? We were never sure about that. Or rather, we soon became convinced that it was not the case. It became more and more evident to me, at least, that despite Barth’s opposition against the spirit of the Enlightenment and his rejection of modernism in theology, he himself was a thoroughly modern man and that his theology in fact bore witness to that fact. In reality Barth was centuries away from traditional orthodoxy. It is true that he had appreciation for the Reformers and especially for Calvin. He himself tells us how he turned to Calvin’s Institutes when he prepared his first lectures in Dogmatics, and how much he was helped by discovering Heinrich Heppe’s Reformed Dogmatics. But that does not mean that Barth could identify himself with Calvin or Reformed orthodoxy.17 When he really discovered Calvin and the Reformed orthodoxy his rejection of liberal theology had already taken place. It was not the theology of the Reformation that had influenced him in his turn-about. He never mentions Calvin and very rarely Martin Luther when he tells us about the theologians that had decisive influence on him. The majority of the names in these lists represent theologians of the modern era.18 It is simply mistaken to imagine that Barth’s opposition against the spirit of the Enlightenment and modern theology was launched from a pre-modern basis. Barth has often been criticized for not having heeded the people to whom his message was addressed, and Sperna Weiland has even compared his theology to a house without a door, adding that if, walking around the massive building of the Church Dogmatics, one should get a glimpse of what could seem to be a door, one would, when trying to enter, be confronted with the word “Nein!” written on it. Of course, this is a distorted picture.20 From the very beginning Barth intended his theology to be relevant for his time. Clausert has proved convincingly that there has always been a close link between Barth’s dogmatics and his desire to speak a word that would be spiritually and politically relevant.21 He was not indifferent to the needs and aspirations of modern man, but he was convinced that it was not necessary or enough to indulge in hermeneutics in order to help modern man, to understand the gospel. What he really needs is to know that God loves him. The gospel of God’s grace in Christ Jesus is simple enough for any person to understand, even for modern man, and that is all that he needs to know22. Nevertheless, the similarities between Barth and his theological teachers should not be overlooked. What he shared with them was the historical situation of modern Western man, the problems created for the theologian by modern philosophy and the modern view of the world in general, and he could not go back behind all this, neither did he want to. Barth accepted the challenge to be a modern theologian. He did it critically and with a deep sense of commitment. In this process he took decisive decisions and altered the whole course of modern theology, but it cannot be denied that he incorporated in his theology specific elements of the modern spirit and used certain basic concepts of the Enlightenment that demanded their toll. The theology of Barth can only be understood against the background of the Enlightenment. It forms the negative presupposition of his exposition of the Christian faith. Barth never neglected modern man, as has often been stated. He always had modern man in mind and in his own heart.25 He rejected the idea of apologetics in order to defend the Christian faith before the forum of unbelief, but in a very definite sense his exposition of the Christian faith contains a form of hidden accommodation to the spirit of the modern age, in the sense that it evaded certain issues that could be unacceptable to modern man. Like the Ritschlian school and especially Herrmann, Barth tried to escape the consequences of historism. Like them he tried to do this negatively by rejecting the possibility of natural theology and metaphysics, and positively by observing a very stringent form of Christocentrism. The reason for this is obvious: like the Ritschlian school Barth counteracted the growing secularism of his age by asserting that the revelation of God had its own sphere where it could not be reached by the criticism and uncertainties of modern man. Barth only takes the secularization much more seriously than his teachers. He also takes up the challenge of the criticism of religion since Feuerbach. Consequently, he cannot remain in the position of Ritschl and Herrmann, who had seen religion as the point of contact between God and man, as the locus of divine revelation. Barth had to be much more radical than they had been.26 In his reaction to historism and the atheistic criticism of religion he saw no other possibility than to deny that the revelation of God could take place in nature and history. The fierce attacks of Barth on natural theology and the Christocentrism of the Church Dogmatics are directly connected with his reaction to the modern critical mind, which he takes seriously. His method is to radicalize the positions taken by those who criticise Christianity by being even more critical than they are, but then claiming that the revelation of God is not touched by their criticism, exactly because it is of a totally different order. Making use of Overbeck’s concept of “Urgeschichte”, Barth tried in the Römerbrief to explain how it was possible that the revelation of God could take place above and outside of our history, and yet effect it profoundly. In his later development he dropped this concept and replaced it with the concept of “Geschichte” (as opposed to history), while he also introduced a theological doctrine of time.27 This supplied him with the tools he needed to maintain on the one hand that God’s revelation in Christ did take place in our time and history, but on the other that revelation belonged to the order of Geschichte, and as such to the time of the revelation which is God’s time, the time that is sheer presence, because it is fulfilled and therefore contains and penetrates every moment of history. The actualistic concept of revelation which Barth maintains and which he defends by an appeal to the freedom of God, enables him to secure the reality of the revelation of God in the face of historism. Only thus could he maintain the truth and reality of the encounter of man with God in the face of the critical questions of modern man. He took the modernist reservations about the Christian message seriously and gave answers that did not ignore them, but showed them to be incapable of hampering the Christian truth. This is very well illustrated in Barth’s view of Scripture. While he never rejected the historical-critical method as such, in his own handling of the Bible he did not make use of it. Neither did he ignore its points of view. He took the position that the historical-critical method was not critical enough, which in fact meant that he radicalized its presuppositions about the human and historical character of the Bible. Yet at the same time he demanded that the Biblical text must be read with the expectation that it could become the direct Word of God here and now to the present reader.28 In this way he could maintain the Bible as instrument of the revelation of God when and where it would please God to use it, without denying that the Bible was a purely human and even fallible book. That brought a certain spiritualistic element into his view of the Bible, which must be seen as the counterpart of his view of revelation as “Geschichte”. It fitted into his concept of the actualistic character of revelation and provided him with the possibility to introduce the category of saga in order to maintain the reality of the “geschichtliche” truth of the Biblical testimony without having to defend its historical trustworthiness.29 This brings an element of uncertainty into the mind of anyone who reads Karl Barth. Does he really accept the historical reality of God’s great acts in history? How seriously should we take his insistence on the virgin birth, for example? The full significance of the concept of Geschichte is not at all clear. In the same way Barth’s Christological concentration could be used to demonstrate this intention. According to himself this was the most important aspect of his theology as a whole.30 And indeed, the Christocentrism or even Christomonism of Barth, as some critics have called it,31 has indeed become the most distinctive feature of his theology. He himself said that it was this Christological concentration that led him to a critical discussion of church tradition, the theology of the Reformers, and especially that of Calvin. I believe that it gave him the opportunity to free himself from this tradition and made it possible to implement a new theological paradigm that would be in accordance with the modern mind. His Christological concentration has many consequences. At this stage I just want to stress that it serves to reduce the contents of the Biblical message to the reality of the Christ-Event as the revelation of the grace and love of God in Jesus Christ, the living Lord. In some way or another all theological problems are dealt with as aspects of the encounter between God and man in Christ. The Christocentrism of Barth serves to free his dogmatics from a lot of problems that traditionally had to be treated. All modern theologians have reduced the message of the Bible to make it acceptable to modern man. Barth does the same, but he does not do it in the same way. He starts with God’s revelation in Christ, not with man’s religion or experience. No less than other modern theologians, he effects a reduction in the contents of the Bible. The difference is that he does this by concentrating on Christ. Christ becomes the only Word of God and the whole content of the revelation of God, which means that Scripture is reduced to the message of the triumphant grace of God. However, recent interpretations of Barth’s theology have stressed that the modern character of Barth’s theology is revealed also by the dominance of specific concepts in his theology, concepts which were basic to the Enlightenment. By using concepts which were central in the thought pattern of the Enlightenment, Barth identified himself with some of the most basic trends in the modern mind, even if it must be said that he has done this in a critical way. Despite the serious criticism that has been launched against this interpretation of Barth, again we have to say that it must contain an element of truth. Barth’s theology is most certainly not the outflow of his political persuasion, and his dogmaties are not meant as the theory for a socialist political praxis, but there is indeed complete concurrence between the basic principles of Barth’s socialism and some fundamental principles of his dogmatics.36 Politically Barth did accept the principles of the modern period, which is illustrated by his choice for democracy and especially social democracy. However, these principles were also active in his theological thought. That is evident from the way in which the concepts of autonomy, freedom and change through activity are built into his doctrine of God and have shaped his dynamic and “geschichtliche” view of reality as a whole. As for Barth’s universalism, it is again obvious that it is not just a means to correct the Reformed views on predestination by replacing the centrality of the eternal decree by the centrality of Christ. His universalism is perhaps the most convincing testimony of Barth’s modernistic tendency.42 It is obvious that Barth has no Biblical support for it. In his universalistic views he remains true to the convictions of the modern era, of Schleiermacher and the 19th century. In this respect as in many others, he followed in the steps of the Blumhardts. From the very beginning he took a universalistic stand. It is interesting to see how his universalistic idea about the election, which became the corner stone of his whole dogmatics, was already present in the first edition of his Römerbrief, although he expressed it there in terms of organic concepts borrowed from Beck. What happened later was only the explication of the same conviction in terms of his concept of the Christ-Event in its actual and all-encompassing meaning. It is clear that his universalism affects all other aspects of his dogmatic thinking. His soteriology was affected, but also the doctrine about the church with its preaching and sacraments. Moreover, the distinction between the church and the world becomes utterly relative. The church is no more than a sign of the coming salvation of the whole world, and as such it is totally directed towards the world. It has, however, no exclusive claim to the truth, because Christ may use other signs of his kingdom, also extra muros ecclesiae. The ratio essendi of the church is that it is an instrument of the missio Dei. The question is, however, what the contents of the church’s witness to the world will be. To be sure, it will be the triumphant grace of God in Christ, but this message is not brought against the background of the belief that the multitudes will perish in their sins if they do not know and believe the message of the Bible. The concept of an eternal damnation has no place in Barth’s thoughts, just as little as there is place for it in the modern mind. Is it wrong to be modern? Looking back now on what we have said, the question must be raised whether the fact that Barth tried to be a modern theologian is as such enough reason for us to be critical of his theology. I would like to deny that. The theologian should accept the challenge of our modern age. It is not a matter of course that conservatism as such will result in a sound Biblical theology. However, the criterion must always be whether the theologian, even in his endeavour to take modern man seriously, is able to remain faithful to the Biblical message. We must appreciate the fact that Barth took up the challenge of the modern age. We must also be grateful for his critical approach to the spirit of this age and to modernism in theology. Barth has taught us many things and we owe him more than we can express in such a short paper. He was undoubtedly the greatest theologian of our age. However, despite our appreciation for him we must take the liberty to express our hesitations and reservations about his theology. I have severe doubts about the Scriptural basis of elements in his theology, like for instance his Christological concentration and his universalism. I believe that Barth, despite his rejection of the possibility to practise “Sachkritik” in connection with the Bible, that is, to criticize the contents and message of the Bible, nevertheless implicitly did it in some respects himself, for instance in his universalistic views. In this we may not follow him. I also believe that it will take some time before we will be able to determine exactly the full significance of other modernistic elements in his theology. But even so it is worthwhile to read and study Barth and to rejoice in the blessings that the Lord gave us through his life and message. Cf H Zahrnt. Die Sache mit Gott, München, Piper, 1967, 13. Cf J Sperna Weiland. Voortgezette Oriëntatie, Baarn, 2nd impression, 1971, 9 ff. Cf Karl Barth. Letters 1961-1968, ET 1981, Grand Rapids, 5. Cf M Brinkman. De theologie van Karl Barth: dynamiet of dynamo voor Christelijk handelen, De politieke en theologische kontroverse tussen nederlandse Barthianen en Neocalvinisten, Baarn, 1983. Cf Brinkman. oc, 24-119; G C Berkouwer. Een halve eeuw theologie, Kampen, 1974, 49-96. Cf K Barth. Einführung in die evangelisch Teologie, Zürich, 2nd ed, 1963, 15 ff. Cf K Barth. oc, 19, 105ff; Bowden. Karl Barth, London, SCM, 1983, 11 ff. Cf E Busch. Karl Barth und die Pietisten, München, 1978, 181 ff; Berkouwer. oc, 56 ff. Cf KD I/I and I/2; Dieter Clauser. Theologischer Zeitbegriff und politisches Zeitbewusstsein in Karl Barths Dogmatik, dargestellt am Beispiel der Prolegomena, München, 1982. Cf A D R Polman. In de ban der hermeneutiek, Kampen, 1969. Cf P Berger. The heretical imperative, New York, 1979, 79. Cf E Brunner. Dogmatik III, Zürich, 1960, 245-246. Cf D Bonhoeffer. Widerstand und Ergebung, Munchen, 1959, 184 ff. Cf W Pannenberg. Wissenschaftstheorie und Theologie, Frankfurt aM, 174 ff, 266 ff-, H M Kuitert. Wat heet geloven?, Baarn, 1977, 187 ff. Cf D Schellong. Karl Barth und die Neuzeit, Munchen, 1973, 35 ff; Clausen. oc, 61 ff, Heppe/Bizer. Die dogmatik der evangelisch-reformierten Kirche, Neukirchen, 1958, VII ff. Cf K Barth. Die christliche Dogmatik, 1927, VI; also: The Humanity of God, 36-37; Schellong. oc, 38. Cf Schellong. oc, 36 ff who defends the thesis “dass Barths Kritik an der neuzeitlichen Theologie selber neuzeitliche Momente enthält, ja sogar einer dezidiert neuzeitlichen Theologie den Weg bereiten will”. Cf J Sperna Weiland. Er is iets aan het gebeuren, in: Wending 20 (1965), 622; also: Oriëntatie, Baarn, 1968, 57 ff. Cf D Clausert. oc, 21 ff. Cf The Humanity of God, 56-57. Cf The Humanity of God, 38. Cf H Berkhof. 200 Jahre Theologie, Neukirchen, 1985, 180 ff. Cf KD 111, 25 ff. Cf Berkhof. oc, 197 ff. Cf K Runia. De theologische tijd bij Karl Barth, Franeker, 1955; D Clausert. oc, 53 ff, 115 ff. Cf E Jüngel. Barthstudien, Gütersloh, 1982, 83 ff. Cf How I changed my mind, Edinburgh, 1969, 42 ff. Cf P Althaus. Die Christliche Wahrheit, Gütersloh, 1952, 56 ff; A A van Ruller Bijzonder en algemeen ambt, Nijkerk, 1952, 40; G C Berkouwer. De Algemene Openbaring, Kampen, 1951, 69 ff. Cf Tr Rendtorff. Die radikale Autonomie Gottes, in: Theorie des Christentums, Gütersloh, 1972, 161ff, Rendtorff (hrsg). Die Realisierung der Freiheit, Beiträge zur Kritik der Theologie Karl Barths, Gütersloh, 1975. Cf E Jüngel. God as the mystery of the world, ET Grand Rapids, 1983. Cf Schellong. oc, 86 ff. Cf F W Marquardt. Theologie und Sozialismus (das Beispiel Karl Barths), München, 1972; M E Brinkman. Karl Barth’s socialistische stellingname, Baarn, 1982; H Gollwitzwer. Reich Gottes und Sozialismus bei Karl Barth, München, 1972; E Jüngel. Barthstudien, 98-126. Cf W Kreck. Grundentscheidungen in Karl Barths Dogmatik, Neukirchen, 1978, 31 ff, 183 ff; also Kreck. Kirche in der Krise der bürgerlichen Welt, München, 1980, 102 ff. 39. Cf Schellong. oc, 64. Cf E-W Wendebourg. Die Christusgemeinde und ihrer Herr, Eine kritische Studie zur Ekklesiologie Karl Barths, Berlin/Hamburg, 1967. Cf Schellong. oc, 62-68; also: E Jüngel. Gottes Sein ist im Werden, Tübingen, 2nd ed, 1967. Cf Hans Urs von Balthasar. Karl Barth, Einsiedeln, 4th ed, 1976, 210-259; K Schwarzwäller, Dus Gotteslob der angefochtenen Gemeinde, Neukirchen, 1970, 22 ff.